7 Quick Takes (#2): Dreamer in the Spotlight Edition! 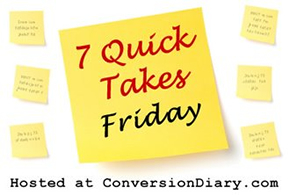 Check out Jen’s and other 7 Quick Takes posts today at Conversion Diary! Hey, Ya’ll! (I’ve lived in the south for 7 years now, so I can say that, right?!) I was having trouble narrowing down who to feature for my monthly Dreamer in the Spotlight post, so I found a solution: A mini run-down of the various people and stories that have caught my attention this month! Consider this your big dose of inspiration for the day! I’m not sure if Tisha is a Christian or not, but what I do know is that this young woman is an amazing example of what can be accomplished if we make the choice to do so, even if it seems impossible. Tisha was born without arms and has recently received attention online for the YouTube videos that she has posted of her doing daily tasks, like making a sandwich with her feet. She hopes to inspire others to be more independent. Okay, so considering I’m a huge ND fan and my husband is OBSESSED with all things Irish football, I had to include the outstanding Notre Dame linebacker, Manti Te’o. The reason that I am talking about him, though, doesn’t have as much to do with his on-field talent as it does who he is as a person. Manti seems to be a very balanced individual who has his priorities in check. This is a young man who was set on playing football at the University of Southern California and the day before signing day changed his mind to attend the University of Notre Dame after praying to God to make sure he was making the right decision. A few weeks ago, Manti’s grandmother and girlfriend passed away within two days. Due to the overwhelming support he and his family have received from Notre Dame, Manti says he is now starting to see why God had him come to South Bend. The Dave Ramsey Show is celebrating 20 years on-air this week! 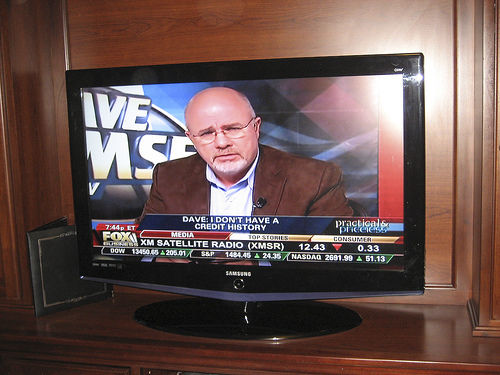 I know many people are familiar with Dave Ramsey‘s radio show, books, and financial advice. Being that he is a fellow “Nashvillian” and centers his work on biblical principles, I thought it fitting to add him to the list! He is a great example of a dreamer becoming a doer and using his gifts to help others! Just a couple days ago, I read Karen Pullano’s story of her family’s choice to pursue the international adoption of her son. While reading her post I was also introduced to the non-profit Down Syndrome Adoption Ministry, Reece’s Rainbow. There are many ways to be involved with Reece’s Rainbow and help children find forever families, so please check out the website! I have been following Helen’s blog Transformed by the Journey for a couple months now. Earlier this week, she posted Career, Serving or Both and I loved reading the story of her career journey and her view of God’s will. I think you will, too! The 11th 40 Days for Life campaign kicked off this Wednesday and runs through November 4th. Since these campaigns started in 2007, some amazing things have happened due to the prayers and sacrifices of so many! Be sure to check out the 40 Days for Life website for more! I’d love to hear your story! I know all of you bloggers and dreamers out there have some amazing “God moments” and I want to share them! 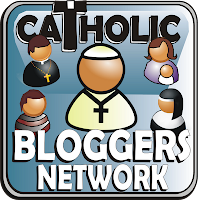 I’ve been enjoying reading so many great blogs and getting familiar with the people behind each of them! Don’t be shy! Please contact me so others can be inspired and encouraged by your personal story of faith and trust in God and His will for your life! I’d love to feature guest posts in addition to interviews for my monthly Dreamer in the Spotlight series. My email is adreamerswife@yahoo.com. I can’t wait to hear from you! Manti’s story has such beauty in brokenness–thanks for sharing it! I’ve participated here and there in a few 40 Days for Life campaigns, but I seem to have been unaware about the current one. The blessing in that, I suppose, is that my state has only 3 abortion clinics, and none of them are close by the college town I live in. I’ll be praying! I wish I could be more involved! I’ll be praying right along with you! Hi! I found you from quick takes! I love your 7 quick takes dream series. So many inspiring stories! #2 – Te’o is an awesome example of a student athlete not afraid to be true to his beliefs (and his desire to serve others which was one of the reasons he selected ND). When I read your post, I just knew that it fit in so well with what my blog is about! Congratulations on your new job! I definitely know how it is to want to spend more time reading and blogging – not enough hours in the day! Thanks for including my story in your Quick takes! And for highlighting Reece’s Rainbow. They are doing such important work for the Kingdom of God. Thank YOU! You and your family are an inspiration to so many!